Ahhhhhhhhhh GET TO DA CHOPPA, it’s got a shoulder thing that goes up! Curses! The dreaded barrel shroud, a weapon that has claimed more lives than Mao Zedong, Adolf Hitler, and Shinji Ikari combined. My mortal enemy. 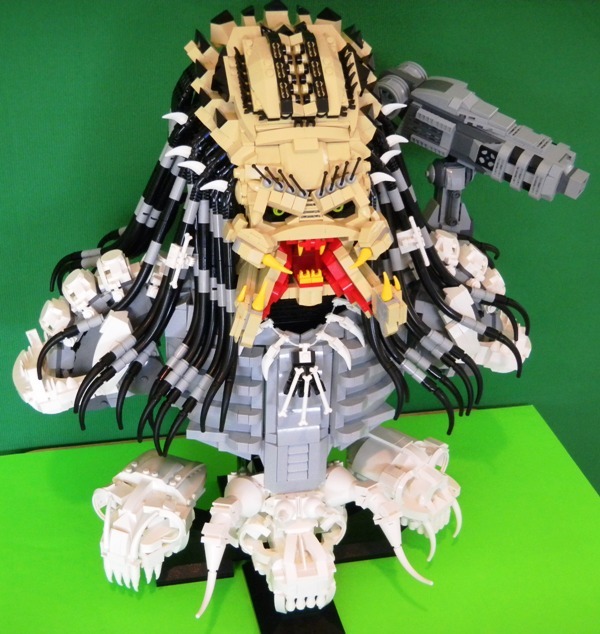 On another note, I really want that Predator thingy sooooo badly. But I’m too poor and artistically challenged to get one! Isn’t there a way for us to redistribute the talent? If you ask you might be able to find blueprints to replicate this. I bet he used Legos from, like, twenty different sets. So it’s more so a matter of funds, determination, and skill at this point. And besides, I don’t really have any of those, I much prefer to get stuff without exerting too much effort (i.e. getting out of my chair). Sounds like you’re a registered democrat. Excuse me? I believe the politically correct term is “societal parasite” thank you very much! I’d prefer if you didn’t use such archaic and, quite frankly, bigoted language. It just shows how ignorant your side is, not blindly agreeing with everything I say. I’ll have to try my hand at making one. Pretty epic, I want one. Dude…. They have to Make a Johnny 5 lego thingy next! Number 5 is alive! Deadly. They should make a kit of this and sell it at LEGO land. Too bad it would be $2000 and come with an instruction book the size of a dictionary.